It is exactly one year since the Kyadondo Rugby Grounds were hit by the Al-Qaeda terrorists leaving 86 dead. A prayer to remember those who lost their lives was organised by the Uganda Joint Christian Council with representatives from All Saints Church, Namirembe church and the Uganda Supreme Muslim Council among others. The grounds were tightly guarded from all corners . 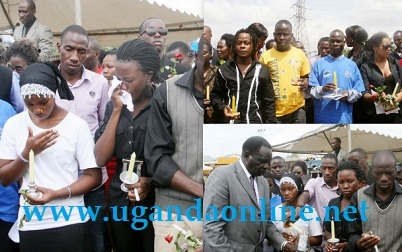 Ministers Hillary Onek, Hon Muruli Mukasa and the Deputy Inspector General of Police Julius Odwe attended the service. The Chairman of the Uganda Rugby Club William Blick, Diplomats from the UK and US Embassies also attended. WBS and UBC outside broadcasting vans were on sight to cover the service coupled with various journalists from newspapers, radio and TV stations. 86 candles were lit for each of the victims. Some of the 86 names included Brian Kivumbi, Charles Matovu, Amina Kabiriti, Alice Kyalimpa and Abbas Muhamed.